Jen Bradbury over at YMjen.com asked me to contribute to a series she was doing on her blog. She had asked a handful of women in youth ministry to share a transformative moment in their faith and ministry. And I think you should read it. Here’s the post I contributed. 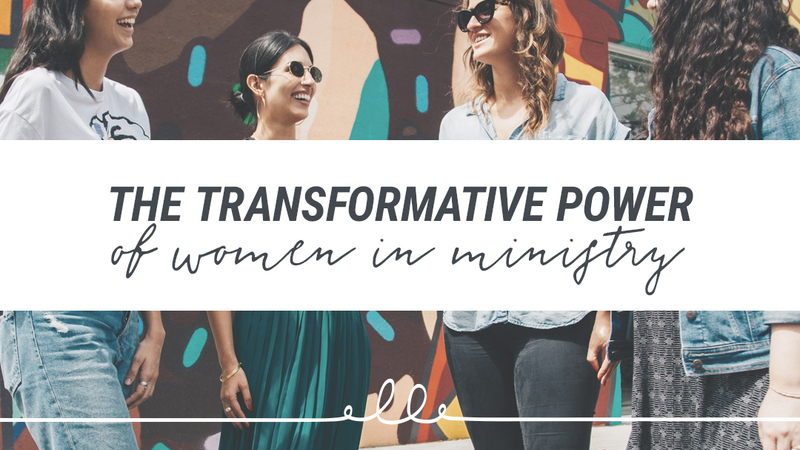 It’s the story of a moment that changed the way I view women in ministry . . . The summer after I graduated high school, our youth pastor took a group of high school students and recent graduates to a student leadership conference. For five days, we were challenged to make a difference, set big goals, have a vision, and change the world. I loved it. Toward the end of the conference, one communicator in particular caught my attention. Because we all have unique gifts and passions, he said, the way each of us serves God should be unique too. Some of us would go on to serve God in the “world,” as doctors or lawyers or politicians or whatever else we wanted to do. And some of us, he said, would serve God in vocational ministry — maybe in a church or missions organization. As a recent high school graduate who was still unsure of what I wanted to do with my life, I paid close attention. I had a ton of interests and talents and passion, but little eighteen-year-old Elle hadn’t figured out how to pull all of those things together for a future career yet. I did know, though, that I loved leading and helping and serving in my church and my youth group. So when the communicator mentioned “vocational ministry,” I started to wonder. Then he asked us to stand. If we thought God had called us to serve Him and make a difference in the world through vocational ministry, we were supposed to stand. I remember thinking, Is that me? Do I want to do ministry? Should I stand? I thought about the small group I was leading, the opportunities my youth pastor had already given me to lead and serve within our youth group, the leadership roles I had taken, and the ministry I was involved with. I thought: Yeah! Maybe I’m supposed to do ministry! Maybe that’s how I’m going to make a difference! For a second, I was super pumped. But then I started thinking about what a future in ministry might actually look like for me. And then this happened: Well, I’m a girl, so I obviously can’t be a pastor or lead a ministry. I tried to think of all the types of ministry I’d seen women do at our church. Children’s ministry, women’s ministry, pastors’ assistants, receptionists . . . that was pretty much it. Oh, and playing the organ. I hated all of those options. I loved the church, but I couldn’t think of a single church role where I felt I could make a significant difference using my passions, my talents, and my gender. So I stayed seated. I wanted to make a difference by serving God in ministry in a local church. But I thought I couldn’t, because I was a girl. And you know what? At the time, this didn’t even bother me. Back then, I took it as a given that women didn’t do ministry in meaningful ways — at least, not on staff at a church. Women didn’t have much of a place there. In my church experience, unless they were teaching small children or other women, I never saw women in meaningful vocational church leadership. As a teenager, I never really thought about the absence of female leaders in my church. I’m not sure it ever crossed my mind. But even so, their absence shaped me. It shaped my view of church and gender and my self-worth and how God could use me. And, for a while, it kind of messed me up. Fortunately though, the day eventually came when I realized that yes, God really did have a place for me in ministry. And yes, I could do big things in the local church while also being a woman. I just wish I’d known it sooner. I wish it had been modeled for me. As an adult (after a lot of growth and transformation in our church’s leadership, identity, and culture), I got to do ministry in the church where I grew up. I got to serve on a team where, as a female, I was heard, valued, respected, and trusted. But I think about that moment at that student leadership conference pretty often. And I think about what we can do, today, to make sure we don’t repeat the missteps of previous generations. I want to see girls grow up believing that they can do whatever God has called them to do — including vocational ministry. I want them to know they matter to God and to the local church. I never want to give them a reason to question their voice or value or place in the Body of Christ. I want them to see strong women leading and teaching and making a difference in their own churches. That’s why, in our ministries, we’ve chosen to put women in key leadership positions. We gave girls microphones and put them on stage. We had girls (high school, college-aged, and adult) teaching, leading worship, hosting, planning, interning, discipling, and doing really awesome, meaningful ministry to teenagers. Someday, I’m guessing at least one of the girls from our church will find herself thinking, Hey! Maybe I’m supposed to do ministry! Maybe that’s how I’m going to make a difference! And when that happens, I’m hoping her next thought won’t be, But I can’t. I’m hoping it will be something like, Yep. I’m ready.